I didn’t know what the woods had in store for me when I set out that day. I only knew that I’d been cooped up too long and I was feeling a bit of cabin fever. Not the kind you get from being stuck inside during a blizzard in the Rockies, or the kind you get during a long, cold Minnesota winter, but the kind you get being a typical member of modern American society where we spend close to ninety percent of our time indoors. I also felt like I needed to burn off some steam. We’re fortunate in our neighborhood to have wooded trails around two ponds—where much of the run-off of our watershed collects—just a short distance from our house. My plan was to take a good long walk around those ponds. It was chilly for late fall. Highs weren’t much above freezing, there was a slight breeze, and my body had yet to acclimate to the change of season. I chuckled at myself; by early spring those same temperatures would feel downright balmy. I was determined to set a vigorous pace to get my blood pumping and warm up. But as I walked a short distance into the woods, I stopped to take in the stillness. There was a sudden, silent flash of wings from the forest floor ten feet away. All thoughts of a vigorous walk, let alone the stresses of daily life, the push and pull of work and family, were forgotten in an instant. A large northern barred owl, Strix varia, had startled at my approach and flown up to perch on the horizontal trunk of a storm-toppled tree. I stood transfixed at the sight as she turned her gaze my way, flooding me with a familiar sense of joy and connection. Looking into her eyes, I was looking into the eyes of nature herself. In that mutual gaze, the owl and I, and the rest of nature were not separate. I say familiar, because I experience a similar feeling any time I encounter nonhuman beings in nature. We don’t think of these kinds of experiences, these moments of deep connection with nature as something that typically happens in an urban environment, but they can, and do, if we allow them to. This requires us to pay attention to something other than our smartphones for a moment and get out of our boxes, whether our homes, offices, or cars. Urban planning that allows for the interpenetration of nature with our cities can certainly help in this endeavor, but whether we reconnect with nature individually or as a society, the same thing is required—a change in consciousness. There are many techniques or activities that can help us on this path of return to nature. One of the simplest is “free and easy wandering” inspired by another ancient Daoist text, the Book of Zhuangzi, which has a chapter named after this idea. A later Daoist, Wang Chongyang, had this to say about it, “There are two ways of wandering. The first is to relish the spectacular scenery of mountains and rivers and enjoy the colorful bloom of flowers and trees. The second way of wandering is to pursue inner nature and destiny and search for mystery and wonder.” Or in other words, a nature walk. I didn’t set out to have an encounter with another being that day. But it was a welcome wake up call. A reminder to rouse myself from the sleepwalking state that we can often find ourselves in. Asleep to the natural world around us, wrapped up in the drama of our daily lives. Owls have often played a role in our myths and stories. Some cultures see them as symbols of wisdom or good fortune, others as harbingers of doom. I’ve always tended to view them as the former rather than the latter. 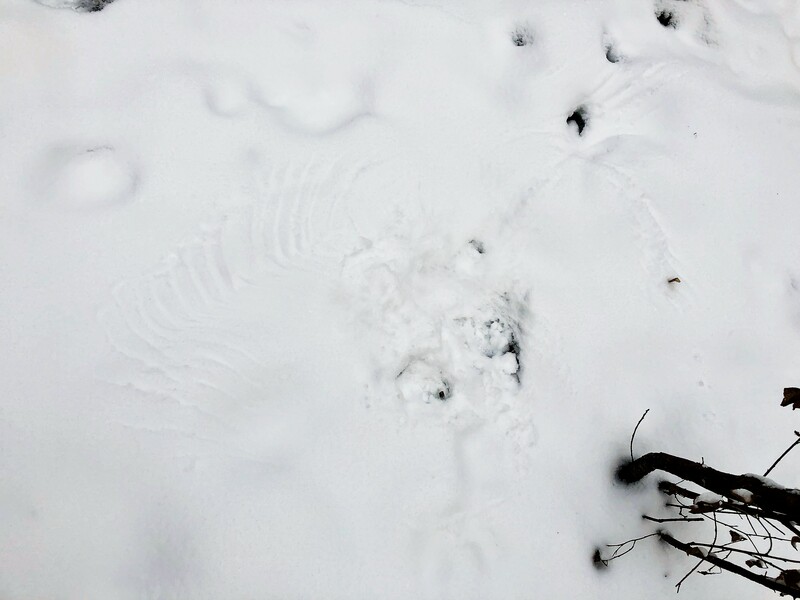 Although, the next time I returned to those woods, hoping I might spot the owl again, the only trace I found was an imprint of her wings in the snow where she found prey. Good news for the owl, doom for the rabbit who had become dinner. 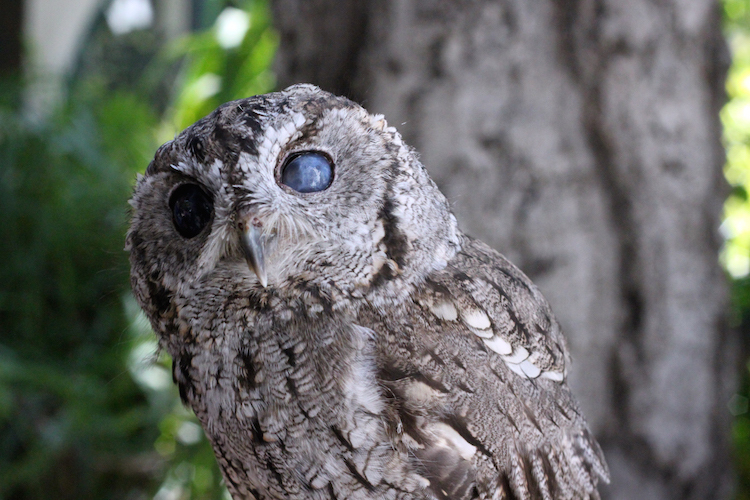 Reflecting on my experience with the northern barred owl near my home, I recalled another owl I’d heard about a few years back, a blind western screech owl named Zeus. Zeus greets the children and adults that visit the Wildlife Learning Center in Sylmar, California. His unseeing eyes hold a surprise for those who meet him—his dark eyes look like the star-filled night sky. Like a blind oracle, he reminded me that when we look within, we can see a whole universe inside us, and when we experience the natural world around us, we may gain insight into our selves. 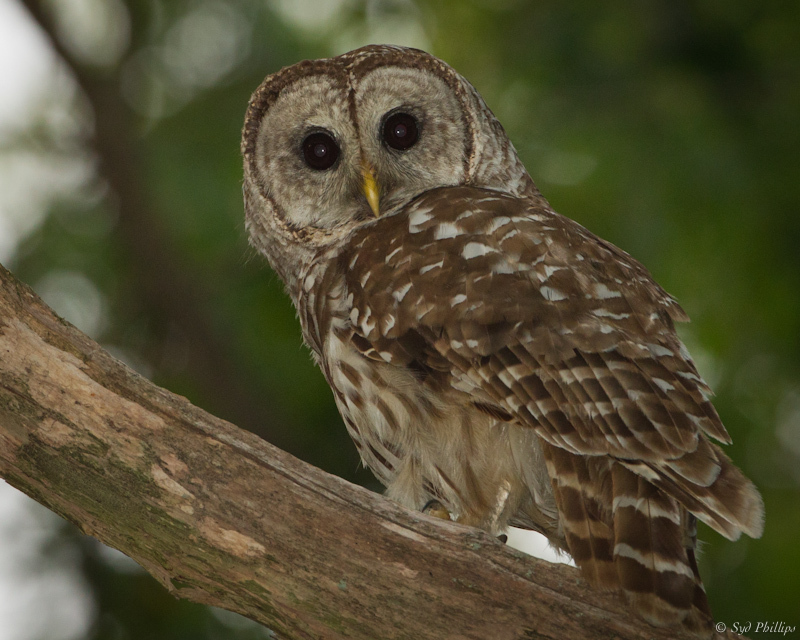 Zeus’s distant cousin, the barred owl I encountered on my walk in the woods, left me with a similar feeling. Her gaze affirmed that “free and easy wandering” is not only a cure for cabin fever; it is a pathway to the universe without and within.